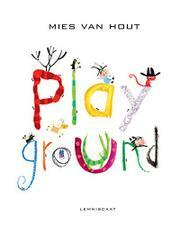 A playful book about play. Text is subordinate to the compellingly vibrant, free-form pen, crayon, and watercolor illustrations in this highly original import from Dutch artist van Hout. The brightly colored endpapers and the instruction to “Find the way with your finger” give the first clue that this is actually a maze book, although it’s not described as such. The protagonists, a little white boy and girl and an orange cat, set off to find the playground. In this universe, it is better to travel than to arrive: the wild and wacky mazes they navigate—bright magenta and red dunes, blue swamp, berry-patch maze, cliff slide, mountain, puffy clouds, scary cave complete with bats and a multicolored monster—are infinitely more interesting than the conventional black-and-white swing set which rewards their efforts. On each bright spread, an increasing number of animals tags along, and the fox, goat, crocodile, ants, penguins, deer, and goat become part of the Greek chorus reacting to the relatively dull conclusion of the quest. Beautifully produced, with a humorous detail at every turn of the mazes, this book will give endless hours of point-and-trace fun to young children and their caregivers. The clever mazes encourage children to interact with the images every bit as meaningfully as with a digital medium.